We LOVE tours, and offer escorted, personally escorted, and independent tours. There are several great things to point out about each of them. Traveling on an escorted tour allows you to experience different destinations with all of the features packaged together at one great price. Your English speaking guide as well as the hotels, transportation, major sites, attractions, and most meals are included in your pricing. Relax in our luxurious motorcoach (most with wi-fi) and enjoy viewing the most beautiful scenery in the world as you journey in comfort to your next exciting stop. Our independent tours combine the best of two worlds. You'll enjoy the freedom of planning your own itinerary but take comfort in knowing your hotels and transportation have been previously arranged. There's an English speaking guide in the lobby of your hotel to answer your every question and assist you with booking optional tours, obtaining those hard to get tickets and passes, and even make restaurant recommendations. Independence with assistance, you're going to love our independent tours. Italy is the number one choice among our clients for escorted touring. Greece, Ireland, Great Britain, France, European Sampler Tours and Australia are also very popular. The point is this, we can arrange an escorted tour for you almost anywhere in the world, we've personally escorted these tours, and we have access to better than online pricing. 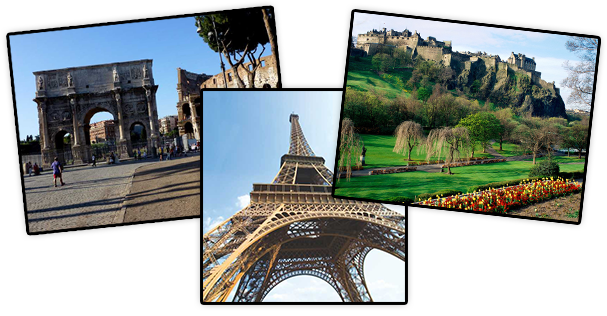 Whatever your travel dreams are, we’ll arrange the details so your tour is picture perfect. Call us at 918-339-4805 or fill out this form and tell us all about it.